Here’s an epic selection of songs that make me feel good — let me know if you have any to add! 1. Feel Good – James Brown – The title says it all. It’s hard not to feel good after hearing James Brown telling you how it is. 2. I can see clearly now – Jimmy Cliff – One of the happiest songs I’ve ever heard. It describes the feeling when you realize that all the bad things happened for a reason and you can see clearly now that life is amazing. 3. Pharrell Williams – Happy – This song always makes me happy. 4. Colbie Caillat – Brighter Than The Sun – Very optimistic song. 5. 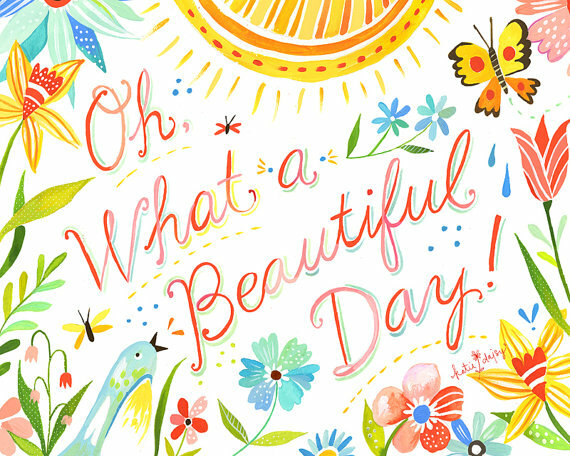 It’s a Beautiful Day – No matter how bad your day may be, there is always something beautiful happening. This song reminds us that every day is a beautiful day by itself . 6. Walking On Sunshine – Quite possibly the happiest song ever! The upbeat tunes of the song brings a smile to anyone just by listening to it. Make sure to dance along as you listen to the song! 7. What a Wonderful World – This beautiful song reminds us to appreciate the beauty of everyday life. There’s just something about pausing for a moment to reflect on the beauty of nature and the universal goodness of the human spirit to have a more positive, refreshed attitude. Everything in life is a miracle. Let’s appreciate and give gratitude to all these things we have with us today . 8. Always Look on the Bright Side of Life – Monty Python – No matter in which circumstance you find yourself in, focus on the positives. 11. Bobby McFerrin – Don’t worry Be happy – This song makes me smile every time I listen it. Great voice, great song, great melody.. It’s just perfect!